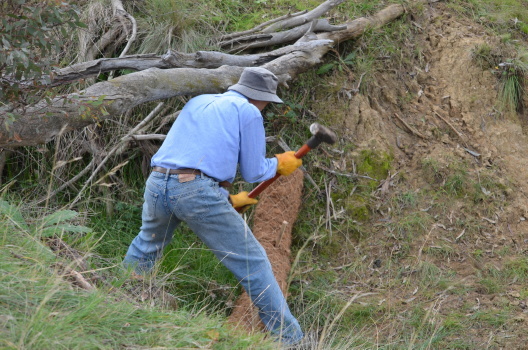 On Saturday 14 April, a team of 11 fotpins (see photos below) completed planned erosion control works at the top of an eroding gully in Bottom Pinnacle. This location had been identified by our 2011 drainage line stability survey as the most unstable gully in the area that fotpin cares for (the Pinnacle Nature Reserve, Bottom Pinnacle and North Kama). The images below show a close up of the eroding area, with the general siting of the control works indicated by the marker. The map on the right allows you to zoom in and out or click to open in in a full-size browser window to get a better idea of the location of the control works. With guidance from member David Tongway (co-author of the book "Restoring Disturbed Landscapes: Putting Principles into Practice"), we installed 60 coir logs (3 m long by 200 mm diameter) at strategic points around the gully. Three logs were secured in the gully itself, along with woody material, to prevent further erosion at the very top of the erosion zone. Coir logs are made from coconut fibre; they slow and spread the flow of water, reducing its erosive power, and trap sediments behind them. These sediments will eventually stabilise and be colonised by vegetation, further reducing the impact of water flowing into the gully. 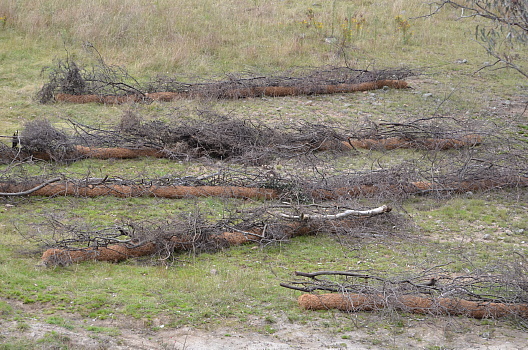 The logs were staked to keep them in place; branches from Cootamundra Wattle removed from the Pinnacle Nature Reserve were packed around them to enhance their erosion control performance and to protect the logs from kangaroos (which like to munch on them). Starting at around 9am, we finished by 1.30pm. 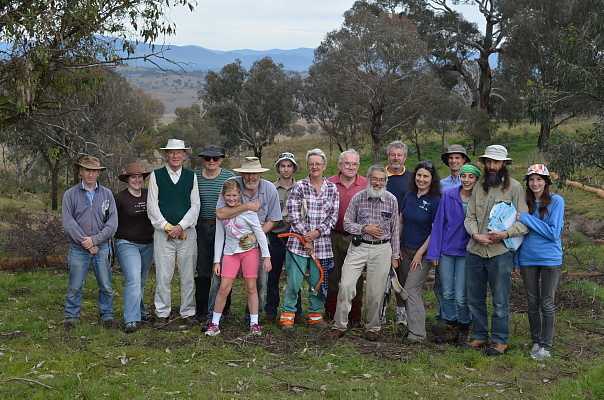 We were briefly joined by Don Driscoll and family who were applying sugar to the grass experiment plots, one of which is adjacent to the gully (its outline can be clearly seen to the east of the erosion site if you drag Google maps image above to the left). 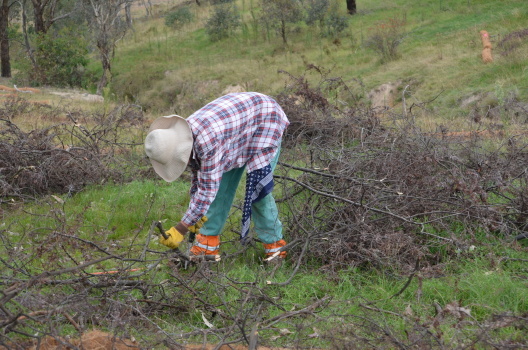 Thanks indeed to ACT Parks for supplying the coir logs and stakes, and helping us remove the Cootamundra Wattle (a weed in this area) and transport it to the erosion site. 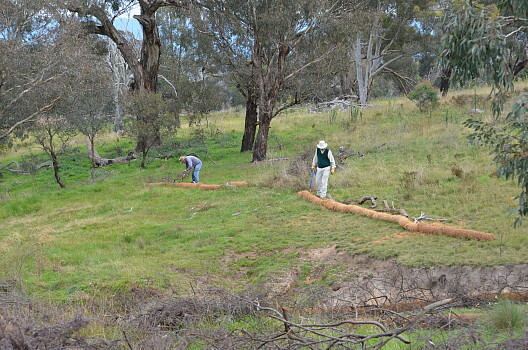 Funding for the coir logs came from the ACT's Woodlands Restoration Plan. 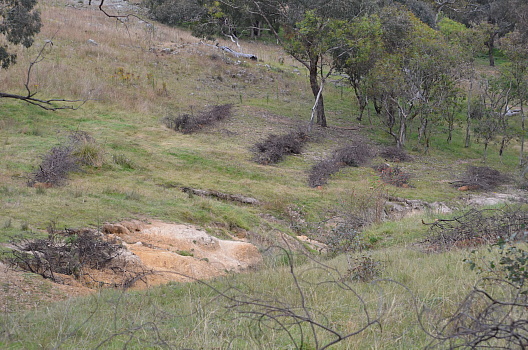 The area around the gully is earmarked for revegetation as part of that Plan. 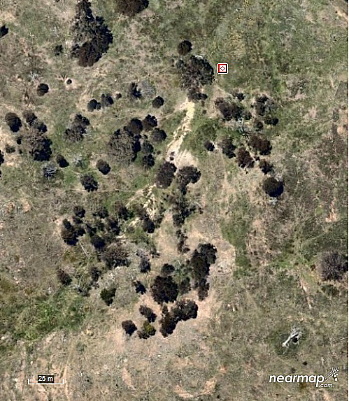 fotpin and Greening Australia will be conducting a community planting day in this area in the near future. This is the first significant erosion control activity planned and managed by fotpin. There are several more areas in the Bottom Pinnacle that need this intervention, and we hope to be able to carry this out this year if further funding is available for coir logs.